Technology shares have outperformed all other sectors in the past ten years. After a strong correction, the market has rebounded. 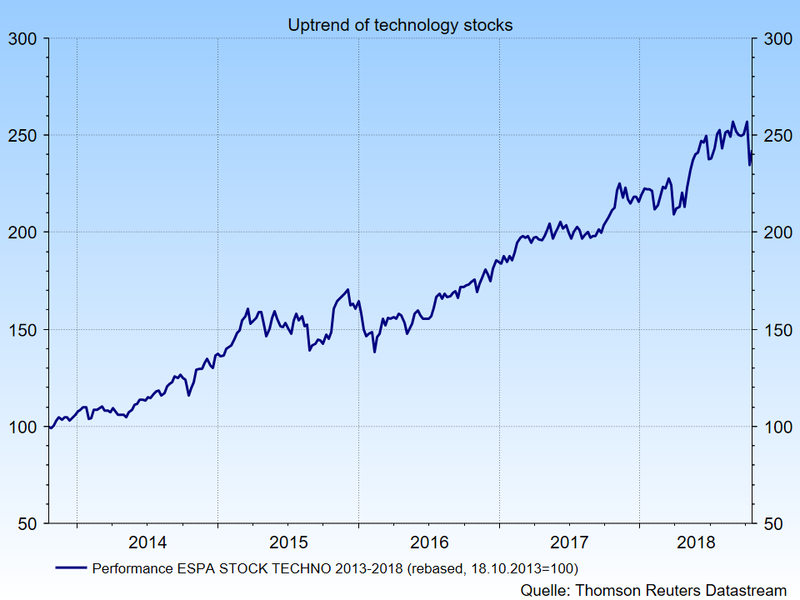 How does Bernhard Ruttenstorfer, Senior Fund Manager of ESPA STOCK TECHNO, see the future of technology shares? The correction around the middle of October did not really surprise you? That’s right, technology share prices had been on a significant upward trend since 2008. Of course, it had been interrupted a few times, which is also healthy, but such breaks would never last long. Generally, growth shares currently command high valuations relative to value shares, and there are good reasons for that. We can still see rising sales and profits for technology companies. Many business areas are not yet developed, many innovations have not yet matured. Disclaimer: Forecasts are not a reliable indicator for future developments. So, everything “A-ok” then with technology shares? Of course, there are stumbling blocks that the market and the companies do not foresee. For example, let’s look at social media: Facebook has recently had problems in the area of data protection, having passed on user data to the company Cambridge Analytica. Politicians now want to up their game in terms of regulation. They want to contain the dissemination of fake news. This means that laws could come into effect that would curtail social media. Stricter regulation could cut sales and boost costs. In Europe, we have received the first taster in the shape of the General Data Protection Regulation (GDPR). What product trends and innovations will be the future drivers of the technology sector? Generally speaking, we can see broad demand across numerous sectors. The technology companies do not only target “normal” customers but also industrial clients. In the car sector, the IT share is constantly on the rise. Some manufacturers are currently testing safety assistance systems and autonomous driving systems. Communication in the car is becoming more and more important, e.g. through digital displays. Electromobility, too, requires more IT in the car. In industrial production, the field of robotics is becoming more relevant. This concerns the establishment of links between factories so as to facilitate faster and more flexible production. In manufacturing, robot-operated production lines are being modernised. Mercedes manufactures an electric version on the normal production line. Here, supplies and every move have to work in real time. In the field of medical engineering, we will soon see hearing aids with integrated live simultaneous interpretation. They contain a lot of technology due to the required IT link, powerful processors, and strong batteries. All of that has to be compact and light. What is the situation on the smartphone market? Smartphones are not the big money-spinners anymore, but we remain very keen on social media. Some titles like Facebook and Twitter have been punished by the market for being late to certain trends. This was also confirmed by low sales growth in their latest quarterly figures. However, these providers will not be dissolving into thin air. The question is: is there a new provider who can call out the established services? If that is so, Facebook could for example just buy it, as we have seen in the cases of Instagram and WhatsApp. While these were expensive deals, it was the right decision. Let’s talk about ESPA STOCK TECHNO. 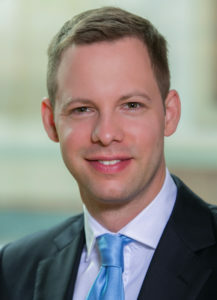 How is the fund positioned in the current environment? What shares are you betting on? ESPA STOCK TECHNO invests in the most important technology companies worldwide. The USA dominates the field. At the moment, we are overweight in the manufacturers of semi-conductors. Hardware and storage space producers are underweighted relative to the technology index. We are also pursuing the odd single-title bet. For example, we hold the biggest overweight in Nvidia, the market leader in Artificial Intelligence. Autonomous driving, e-gaming, and artificial intelligence at data centres are also interesting themes for the fund. The software vendor Workday has developed HR software that operates fully on cloud-basis. We can also see strong growth potential in Electronic Arts und Activision Blizzard in the live-streaming of e-gaming tournaments. In Europe, our Villach-based “local hero” Infineon has been driving the development of the Internet of Things, industrial and robotic communication, and energy management. ESPA STOCK TECHNO covers all these themes and companies. What is the earnings outlook for technology companies? The consensus estimates by analysts forecast aggregate earnings growth of 20% for 2018 and 2019. In 2020, earnings are expected to rise by 10%. All of that amid double-digit sales growth. This means the outlook is good. Set-backs of share prices, the likes of which we saw around the middle of October, have to be considered when taking investment decisions. The interview with Bernhard Ruttenstorfer was conducted by Dieter Kerschbaum. Participation in the most important global high-tech companies. Opportunity to achieve substantial capital appreciation. Broad diversification in global technology companies. ESPA STOCK TECHNO may exhibit increased volatility due to the composition of its portfolio: i.e. the unit value can be subject to significant fluctuations both upwards and downwards within short periods of time. Equity investors: Are they ignoring risks? Data leak by Facebook – are technology shares at risk?